Tove Jansson came from Finland. Let’s be quite clear on that. The reason why some of you believe she came from Sweden, is that she’s a Swedish speaking Finn. Swedish name, wrote in Swedish, but a Finn. Tove’s niece is here. So’s her biographer, Boel Westin, who’s just had a biography of Tove Jansson published. 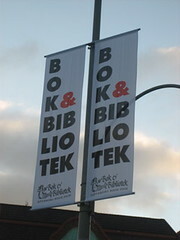 It’s called Ord, Bild, Liv, which means Words, Pictures, Life. The Finnish bookshops here have a lot of Tove Jansson books on offer; mainly Moomins, but also on Tove’s art and other books. After nearly slicing my finger off with the breadknife at breakfast, and then running for the tram (not recommended for very old witches),it was a great relief to bypass the massive weekend morning queues and go straight in. You too could do that, with a “foreigner’s” half price four day all inclusive ticket. Makes a person feel less like a nobody. And then it’s very nice to sink down and rest in the comfortable chairs in the lecture halls. The main danger is falling asleep in them. And I don’t know what Jeanette Winterson was thinking when she said how awful the lecture hall was. Don’t ask her back. I skipped my first morning lecture with Simon Sebag Montefiore talking about Stalin. I realised I had no interest in him or his book, and I only liked his interviewer, Peter Whitebrook. He is always good. I was rewarded when I saw him somewhere else later on. Sunday turned out quieter than expected. 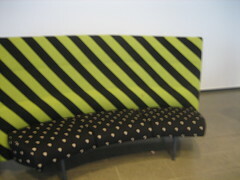 The away-from-it-all areas are nice and restful, and I’m writing on the curved sofa with limegreen and black diagonal striped back and black seat with cream spots. Just as nice as it sounds… I’m using this year’s notebook with the mermaid cover and writing with the silver mermaid pen. Of the other freebies I gave away both the apple and the packet of chocolate muffins. Before catching the plane home there was just time for a talk on music; more specifically about one of the most popular songwriters of all time in Sweden, Evert Taube. His son Sven-Bertil was there, ready to sing to an adoring audience. I had heard the joke about his father before, but it’s a good one. I have never cried at the book fair before, but twenty minutes with Henning Mankell had me wipe my eyes on my sleeves. I have promised to do a piece on him, but anything else I want to say will have to wait until later. Today it’s all about Sofia. 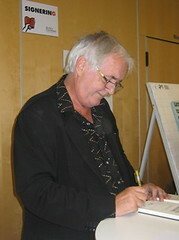 Henning has written three books about Sofia, called Secrets in the Fire and Playing with Fire. The third, Eldens Vrede, hasn’t yet been translated. Sofia is real and lives in Mozambique. Twelve years ago she lost her legs in a landmine, and her sister was killed. Henning writes about what happened and how she has fought her way back to as normal a life as she can have. I have read the first two books, and so have most of Sweden’s eleven-year-olds (of a few years ago), as the books were handed out free in the schools. They now have strong views on landmines, and write letters to Sofia by the sackload, which Henning takes with him whenever he goes. The official understanding on how landmines work, is that it needs the weight of a soldier’s boot to set it off. Clearly not true. The good news is that Sofia is happy, most of the time. She is in her early twenties now and has three children. She is well known in Mozambique, and the proceeds from the books go straight to her, which helps with the cost of living. Sofia’s doctor admitted to Henning that he wished Sofia had also died, so bad were her injuries. When Sofia recently contracted malaria, the treatment was at times very painful, but she showed no concern, as what she had gone through before was so much worse. What Sofia does miss, though, is being able to dance. It’s part of how African women express themselves, and she can’t join in. She turns away when she sees others dancing. Henning tells Sofia what he writes, and he has become a kind of father figure to her. After the first book came out, about ten years ago, Henning had lunch with Astrid Lindgren. He told her the story of Sofia, and she immediately arranged for some books in Portuguese to be sent to her. So Sofia read Pippi Longstocking. She very wisely assumed that as it was impossible for a girl to lift a horse, that it really was about strength of some other kind. She then made a dress for Astrid, believing her to be a little girl and not a woman of ninety. Henning is off to Mozambique next week, and he will say hello to Sofia from all of us. Do read the books about her. The lady who wanted to know the way to K2 didn’t believe me. There’s another escalator? We were both going there to see Desmond Tutu. As expected there was the most tremendous queue, but I have to admit to having learnt some small ways of cheating very slightly. Very bad. Sorry. There were a great many archbishops all of a sudden. Three, at least. Two of them are regulars at the fair, and one of them once did the washing up with Son when he was about nine. But it was archbishop Tutu we had all come to see. He is very charming, and quite short. He is also very funny and sometimes comes across as a naughty little boy. I didn’t even try to get his autograph, but never mind. I have seen him. Did get autograph from Peter Robinson, who was also rather nice. I have yet to read any of his books, but will do so, as everyone recommends them. I hope he couldn’t smell the pizza slices I was carrying around, hoping to find a moment in which to eat them. LHoC was there, and was quick to ask questions about his favourite music. I’ve already forgotten what. Had hoped to have a free Lent bun, but in the end decided I had no time standing around waiting for a handout. There is a fictional children’s detective who eats lent buns all year round, and a crime (books) organisation was going to hand out 700 of them, despite it not being Lent. I’m grateful to have learnt all the quiet back corridors that take people like me from A to B without getting stuck in fair “traffic” everywhere. I was also pleased to see that there was even a queue for the gents toilets, until I discovered that it wasn’t so much equality of the sexes, as the ladies taking over the other toilets as well. Good thinking. There wasn’t too much of a crowd for Per Gessle, famous Swedish popstar. Possibly because his fans don’t go to book fairs. There’s a new biography out soon about his life, which explains his presence here. For me it was nice to listen to him, as we share the same hometown, and however awful, the accent makes me feel good. For all those of you who haven’t heard of his group Gyllene Tider, don’t despair. He’s also one half of Roxette. If that doesn’t help; please despair. Or google. The queue for Amos Oz was everywhere and nobody knew quite who was queueing for what or where. Amos Oz managed to fill the largest seminar hall this afternoon, and I’ve never seen it full before. It was a good discussion between him and Sigrid Rausing, moderated by the editor of quality magazine Vi. His book How to cure a fanatic, which is impressively short and a very good read, is about to be distributed free to all seventeen-year-old students in Swedish schools. Amos Oz has started the Order of the teaspoon, which is his way of hoping people will try and make a better world. He feels reading books is a good way to stop fanatics, and humour. He himself is a lot of fun, and he enjoys being called a traitor. His daily routine is to get up at five and go for a walk in the desert. Then he has a coffee and sits at his desk waiting for words to come. He considers this in much the same way a shopkeeper waits for customers to come to his shop. Amos Oz is an interesting man, and I strongly recommend reading How to cure a fanatic. And perhaps that you buy a teaspoon. With the large audience today I thought my plans to get my book signed would come to nothing, but in the end not too many of us had books for signing, so we all got to see the man up close. Success. I’m a disgrace. Not only did I escape from the fair for a couple of hours of retail therapy over lunch, but I accosted a perfect stranger in a café. I noticed this man getting his Macbook out with his espresso, so I just walked over and asked if he knew where he keeps his grave accent. Yes. I really needed one yesterday for my French author, so felt it was worth finding out. He did know, but I’ve tried it at home and it doesn’t work. Otherwise another good day, but I can say now that Swedes don’t understand the meaning of queues. They are all over the place, but most seminar rooms are big enough to swallow everyone up, so after the confusion you do get in. After my little shopping expedition I walked round like a bag lady, but I’ve got a good routine by now, so can manage fairly well. I won’t say where, but there are some less frequented areas with lovely armchairs to sit down and rest. I tend to go there with my packed lunch to relax. Today I witnessed several interviews being filmed, complete with umbrellas and lights and microphones and other gadgets. One of my talks today was less interesting than expected, so I have to admit to getting a book out to read. I thought because two of the current big names in crime were there it’d be good, but it all got very cute and soppy. Never mind. So, how many of you have come across this book then? I could only find it in American translation, so presumably the British market does what it’s good at, and ignores minority language books. French is a minority language isn’t it? Foreign, and all that. The author, Faïza Guène was here this afternoon, to receive a prize for her first book, and to talk about it. I must be mad, too, as the seminar was in French, albeit with translations as they went along. The witch does a few languages, but French isn’t one of them. But it was really good. The seminar. The book. And Faïza spoke enough English to let me get my coveted autograph. Kiffe Kiffe Tomorrow is about a young girl growing up in a Paris suburb with her Moroccan born mother. Her father’s gone back to Morocco and married again, expecting to be rewarded with a son at long last. This is a very funny book, even though it deals with poor Arab immigrants and their problems. Faïza was inspired by Salinger, reading Catcher in the Rye with the help of a dictionary. Her heroine Doria is a strong girl, with beautiful powers of observation as regards her surroundings. It’s not an autobiographical story, but Faïza and Doria obviously have a lot in common. This is a wonderful book and well worth trying for a taste of something different. I’m glad I chose not to wear stripes. I do like them and wear them a lot, but here at the fair it would have meant looking like everybody else. It sort of goes with the territory to wear stripes. The witch is plain purple (!) and grey. Nice enough but not too Gudrun Sjödén, designer for teachers and librarians. Norwegian designer chairs in one café, combining practicality with art. Wish they’d considered their teabags more carefully while they were at it. Went to a Pippi Longstocking talk this morning, with Astrid Lindgren’s daughter. I spied Librarian Husband of Cousin in the front row, stopping to chat her up after the talk. Checked out most of the bookshop stalls, feeling pleased I don’t need any new books. The Uppsala English Bookshop has a good selection of English language books.